⇒ The Pine River Library of Leon-Saxeville had a full-page article about their new StoryWalk in the July 8th issue of the Central Wisconsin Resorter. The StoryWalk project has spread to 47 states, and the Pine River Library StoryWalk project is the first in Waushara County. Library director Collette collaborated with the Waushara County Parks department to choose a park and locate an appropriate trail. "Board member Gary Sorenson designed the book page frames, while board member and Wild Rose Elementary Principal Matt Wilbert got the Wild Rose High School technical education department to make them. High school senior Robbie Jansen dedicated himself to the project, making all of the book page frames, with some small “tweeks” from Sorenson to make sure the book pages would stay secure in the frames. 'We got funding to purchase the wood and metal stakes from the Waushara Prevention CouncilHealthy Communities/Healthy Youth and from some private donors, said Ross." 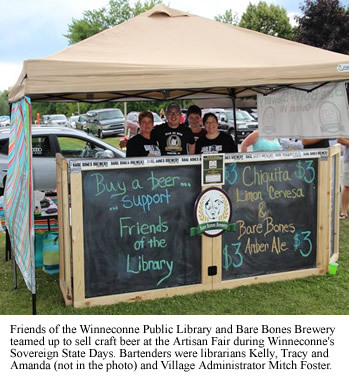 ⇒ The 8th Annual Taste of Wautoma raised $8,327.50 for the Wautoma Public Library. Fourteen local restaurants and grocery stores donated food, 34 local businesses donated items to the silent auction, and 11 local businesses made monetary donations. Tickets sold for $25 each, and each ticket-holder could sample food from the participating restaurants and bid on items at the silent auction. "The proceeds from ticket sales and the silent auction will be applied on the loan that paid for the library 2009 remodeling." ⇒ Every Friday morning this summer is Fresh Fridays! Gardening at the Ripon Public Library, at which the public is invited to achieve health and fitness goals (a.k.a. weeding) while helping to help raise & harvest wholesome, free, organic veggies. ⇒ New in the Children's Room at Menasha Public Library: Grab n' Go Craft Kits. "Everything you need for a simple craft all tucked in a bag ready to check out." ⇒ The Neenah Public Library is partnering with Heid Music to offer ukuleles for checkout. The ukes have a 4-week loan period, and a hold can be placed on them in the shared catalog. The ukulele kits put together by Heid Music include a Kala soprano ukulele, a gig bag, an electronic tuner, and an instruction booklet with access to online learning tools. The Neenah Public Library/Heid Music Ukulele Collection launch will kick off at the Neenah Downtown Farmers’ Market on July 30th. The event will include a performance by the advanced members of the Green Bay Ukulele Club, an open jam session/workshop at the Library, and Heid Music will have a variety of ukuleles in different sizes on hand for attendees to try on for size. And this fall, the library will offer a weekly Saturday morning open jam session for uke players at all levels, and a weekly group class for beginning students of any age. ⇒ Montello Public Library is offering the ABCmouse educational website for in-library use. ABCmouse's "goal is to help children build a strong foundation for future academic success by providing a comprehensive and engaging online curriculum to greatly assist early learners to succeed in pre-k, kindergarten, and early elementary school programs. ABCmouse.com is subscription-based, with no advertising, pop-up ads, or links to other sites. Children can learn and explore with their parents, or on their own (depending on age and ability), in a safe and secure online educational environment." ⇒ A "battle" was fought between directors of the Patterson Memorial Library and the Wautoma Public Library, to see who would get the most dunks in the Wild Rose Days dunk tank. ⇒ Oshkosh Public Library joined the Pokémon Go craze, and their first Pokémon Battle Party brought in 60 people. "As part of the game, the library is a PokéStop and a gym - both of which draw people to our location." The library also participated in a Pokémon Go Scavenger Hunt held in downtown Oshkosh: "We are promoting our free Wi-Fi, we’ll provide charging stations for players’ phones, set lures, and offer a special task for players to complete to earn a ticket for a Downtown prize drawing." The scavenger hunt ran from 2 to 6pm, with an all-ages After Party at the Grand Opera House from 6 to 8pm. ⇒ Fond du Lac Public Library's new Idea Studio had its grand opening on July 23rd; it's a makerspace that's "a permanent do-it-yourself zone where people can gather to create, invent and learn. It includes work tables, equipment to use, display cases, a projector and screen, a demonstration kitchen and a digital recording studio. It will have space for DIY programs. New equipment is being added all the time."